Charlie, Brian, Ronnie, Mick, Keith, Bill get no "more attention" than Mick T. nor than each other; apart from in relation to their longeativity within the band. Any mention of Darryl Jones? While not an official member, he's been with them for over 35 years holding down the fort with Charlie. And what about Chuck? Also not an official member, but he's been there for decades, and is now the "musical director" of their live shows. Surely they must get a mention, or at least maybe a picture of them somewhere in the exhibit? Any mention of Darryl Jones? And what about Chuck? They are included. Plus Bobby, Lisa, etc. It's almost through in Vegas, and yet I can't find one scrap on its next location. It would seem they'd be anxious to sell tickets wherever its headed. Re: Exhibitionism - where next? I believe Sydney is the next location but I'm not sure about dates. Sydney starts in November 2018 : [www.StonesExhibitionism.com] . Sydney has been publicised as being November 2018. Guess who is going to make a trip to Nashville! I'll be in Nashville from March 28 to April 4 with a group of my students. We're coming from Quebec, Canada for a music training. I'll definitely go to the exhibition. Any chance some members of the band will show up for the opening? What do you think? Edited 1 time(s). Last edit at 2018-02-14 00:40 by daniel t.
Woot woot! Ticket bought, I knew if I waited long enough I'd get a chance to see it! This is the last weekend of it in Las Vegas. Going with my husband to see it again this Friday. Anyone else catching it one more time in Vegas? Staying across the street at The Mirage. Read in a recent French issue of Jazz Magazine that it's coming to France...didn't give any date. Just got back from Vegas, totally enjoyed seeing it for a third time! Really felt close to them. Getting the VIP pass was totally worth it! Tomorrow is the last day there. Edited 1 time(s). Last edit at 2018-02-25 06:11 by 2014Slayer. Hey planning on going to Nashville and just wanted to ask anyone that’s been if they’re are any Brian related things like clothes or instruments or things that have to do with him, thanks. Heading to Nashville for sure, will be a good Birthday present for myself! Do you know when you're going yet? We are gong to drive up from Florence sometime to see it, if it's around the same time would be good to meet you. Waiting for it to come to Holland. Yes, clothes and instruments of Brian's are in it! Edited 1 time(s). Last edit at 2018-03-24 05:20 by 2014Slayer. Drove up to Nashville yesterday to check out the venue. Apparently there are at least five tongues around town, we only saw this one, but in our defense, have you tried to drive around Nashville -- "It City" -- these days! Edited 1 time(s). Last edit at 2018-03-28 23:15 by snoopy2. 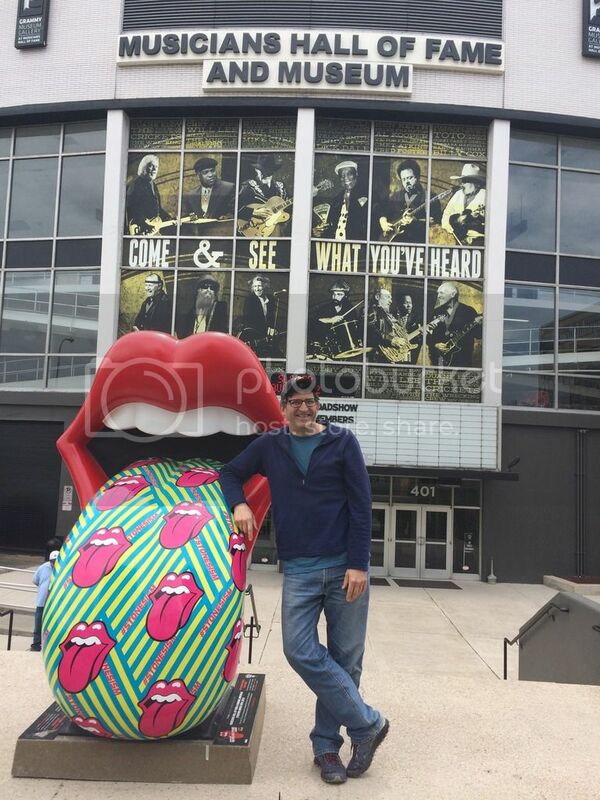 ....I must say, that when I was in Nashville I guess about 10 years back, I really enjoyed exploring that building behind you (I assume that's you) - and I'm not even that big of a country music fan. I guess you are right, having only spent a couple days there, I didn't see everything....but I did also visit the RCA recording studio where Elvis did some recording.